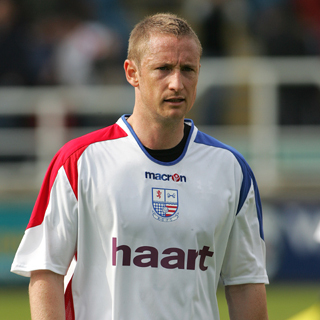 Paul joined the club on 26 June 2006 as Paul Hart began to build a squad after Diamonds relegation to the Conference. He arrived from Woking on a free transfer, but had a wealth of League experience spanning back thirteen years. Paul had started his career with Gillingham, making some 80 appearances in four years. Fulham signed the young left back for £13,000 in the summer of 1996, before joining Brentford in December 1997 for another five figure sum. He moved to Brighton & Hove Albion in July 1999 for the most successful period of his career, and he made 221 apprearances in six years. After a brief period at Coventry City, he had moved into non-league football with Woking in November 2005, but rejected a new contract in favour of the two year deal at Nene Park. Paul proved to be an ever present player at Nene Park at the start of the 2006 / 2007 season, however, as the season progressed, he found his starting opportunities limited, and only played a handful of games at the beginning of the following season. As a result, he went on loan to Crawley Town on 4 October 2007 on an end of season loan, and his contract was cancelled by mutual consent after he agreed terms with the Red Devils the following January. He was released by Crawley in the summer, and spent a short period with Havant & Waterlooville, before joining Bognor Regis Town of the Conference South in July 2008. That was to be his final season as a player and after completing a phsyiotherpy course, he was appointed assistant physio at Brighton & Hove Albion on 11 June 2009. In July 2017 he moved to Sheffield United as their Physio.